Get started in crafting your own beer labels by personalizing one of our awesome label templates. Craft breweries have independently stood out among other alcohol products simply because they aren’t held back by traditional styles of design. Today, labels for craft beer take many forms, from having bold hand-drawn elements to having quirky illustrative elements that convey the beer company’s style. With Canva’s collection of customizable label templates, you’ll be able to instantly whip out awesome-looking labels just in time to market your batch of craft beers. Create a new Canva account to get started on your own Beer Label designs. Whether you’re running a homegrown beer brewing business or have just taken an interest in craft beer as a hobby, you’re most likely to appreciate the effort that goes into creating it, including the labels that wrap around your bottled brews. You can even upload your graphic elements to help you express your beer’s personality. After choosing a label template, experiment with several typographical styles by taking advantage of text holders. These pre-designed text boxes with ready font pairings which you can always modify to your liking. Witty use of images, colors and fonts will help your beer label prominently stand out and set itself apart from commercially produced brews. With over a million images, illustrations and icons in Canva, you’ll never run out of photo options to use for your customized label. What’s most amazing is that while Canva’s library hosts plenty of free elements but you’ll also never have to pay more than $1 for each one-time use of a premium element. Get your beer crafting name out in the world by including your brand assets on your label. Upload your own logo or illustration into Canva for free and use the color wheel tool to reflect your brand colors. 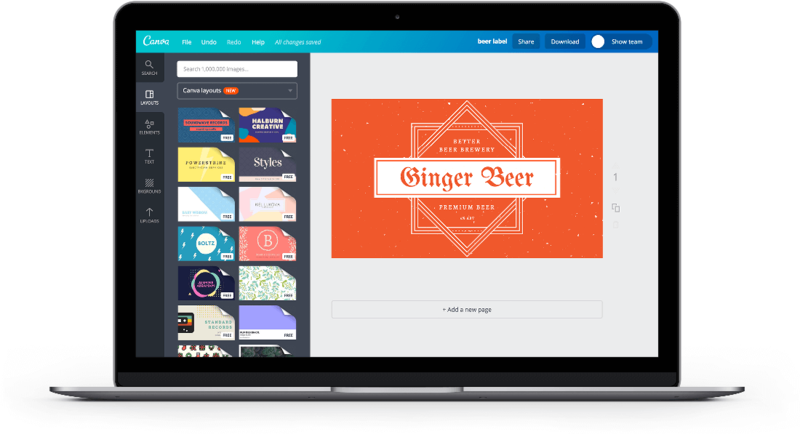 Take your branding several notches up with Canva for Work’s Brand Kit feature. This dashboard lets you conveniently apply your own fonts, logos, and brand colors whenever you create your label, a useful feature for when you want to convey your beer’s signature flavor through your label. If you’re designing several labels, consider using Team Templates. This feature lets you create standardized templates for recurring designs. Can I edit my beer label design after I've saved it? You can edit and save your designs as many times as you like. Every time you create a new design it will appear in the ‘My Designs’ section of your Canva homepage. You can also access all your designs on your mobile devices by downloading our free iPhone, iPad and Android apps from the App Store and Google Play. What if I don’t have any design skills? Can I pre-pay for images? You can choose to pay $1 for individual images or buy credits in bulk so you can get a discount. If you want to make any changes to your design and re-download it, you can do it for free within 24 hours.